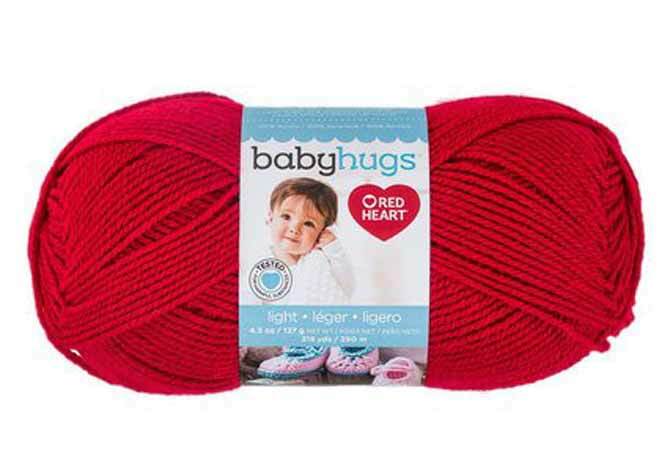 This week we’re working with two yarns by Red Heart — Baby Hugs Light and Baby Hugs Medium. 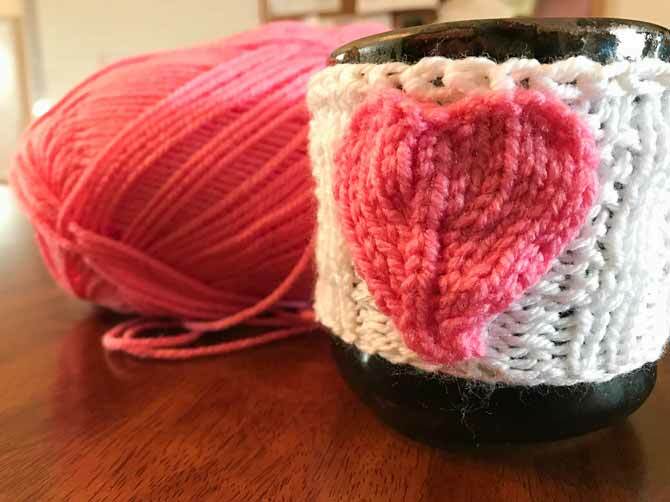 Red Heart paired their Baby Hugs yarn with a pattern for called Valentine’s Day Mug Hug which I believe isn’t just for Valentine’s Day. This is such an adorable knitted pattern to show someone they are dear to you, all year ’round! What better yarn for a mug hug than Baby Hugs yarn? This pattern calls for a medium weight yarn, however I wanted to small-size my mug hug, so I used the thinner yarn, Baby Hugs Light. If you wanted a normal sized mug hug, then you would use the recommended yarn, Baby Hugs Medium. The Valentine’s Day Mug Hug pattern by Red Heart! Change the colors up to suit your kitchen, or make it in pink for a friend going through cancer treatment. I started off knitting this pattern exactly to specifications. I’m a notorious pattern adjuster, but this time, I set out to knit it exactly as written. I suppose it would have helped if I read the instructions carefully. I assumed this pattern was knit in the round. It isn’t — it’s worked flat. You rib to the end of the row and turn to continue this rib pattern all the way back. Going through this whole pattern it never dawned on me that if I made it in the round, there wasn’t going to be space for a handle, and most mugs have handles. Knitting up my heart applique for my mug hug. Make sure you leave long tails at the ends to shape the top of the heart and sew it onto the rest of your mug hug! 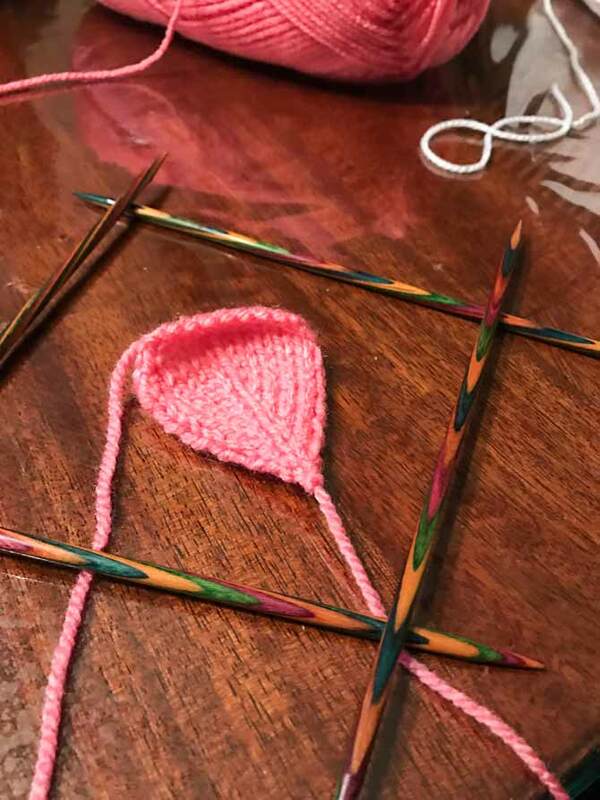 I continued knitting along until I arrived at the end of the pattern and the instructions said to make a button loop. “A button loop?” I thought to myself, “what good is a button loop going to be?” I looked at the picture. I looked at my own version. I looked at the picture again. Then, bam, like a bus, it hit me all at once. The handle! I’m lucky because in my house I have a plethora of mugs without handles. Finished Mug Hug with a hand made pottery mug! Handles are really overrated! 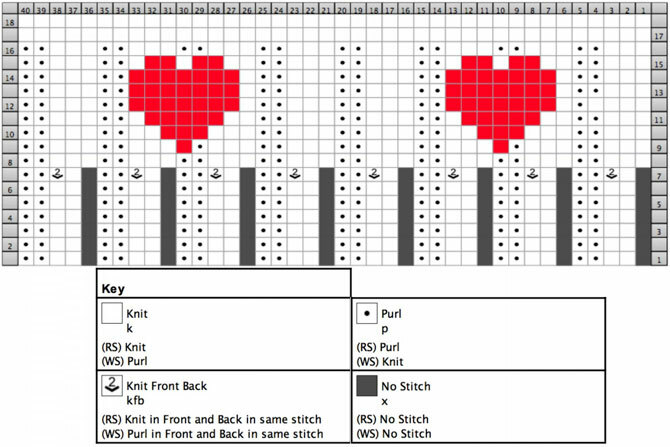 When first looking at this pattern I thought the heart was colorwork. As we all now know, the heart’s a separate piece. If you’re a colorwork fiend like me, you would prefer to use colorwork in your mug hug, so I’ve made the chart below so you can work this piece however you’d like! Here is the chart and key for a color work mug hug. Don’t forget to do the button loop according to pattern instructions and seam up the bottom ribbing. Join me tomorrow, for more knitting fun with Baby Hugs Light and Baby Hugs Medium yarn!